When Arbor Day was founded in 1872, the idea was simple – set aside a special day for tree planting. The Enterprise Rent-A-Car Foundation, of course, sets aside many days a year, as it’s in the 13th year of a special 50-year pledge for tree planting. Every year, 1 million trees are planted as part of the Enterprise 50 Million Tree Pledge – a unique public-private partnership with the Arbor Day Foundation that will continue through 2056. Since 2006, the Foundation has funded a massive reforestation effort with more than 12 million tree plantings. The 12 million plantings represent more than 100 projects in Canada, France, Germany, Spain and the UK – as well as in diverse forests throughout 16 states in the U.S.: Alabama, California, Colorado, Florida, Idaho, Michigan, Minnesota, Montana, New Mexico, Oregon, Pennsylvania, South Carolina, South Dakota, Texas, Utah and Wyoming. Oregon has proved to be fertile ground for the partnership: 2018 marks the seventh year for tree plantings in the state, with more than 820,000 planted to date. And for the first time, Oregon employees could take part in the project this year. For several hours on a rainy, 35-degree Saturday in March, employees from a cross section of divisions and positions and their family members hit the hills of Mt. Tabor Park, a popular Portland park. 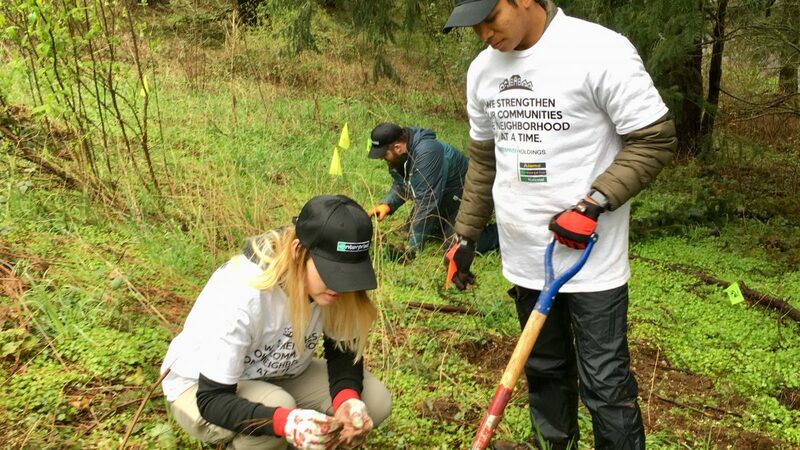 Under the watchful eye of a volunteer leader from the Arbor Day Foundation, the team dug into the soft and muddy ground to plant various trees and shrubs near the Willamette River. Tree planting efforts will help protect the watershed area of a basin that is home to two-thirds of Oregon’s population and generates 75 percent of its economic output, according to the Arbor Day Foundation. Should the opportunity present itself, Megan encourages other employees to participate in a local planting. Check out the recent news release for the latest on the 50 Million Tree Pledge, including plantings in progress for 2018.